ALEXANDRIA, Va. The rule proposed by the NCUA Board Thursday would weight assets in real estate, MBLs and delinquencies. ALEXANDRIA, Va. – Federally insured credit unions with more than $50 million in assets that have concentrations in real estate loans, member business loans or delinquent loans would gain additional capital requirements per a proposed risk-based capital rule the NCUA Board introduced Thursday. Click on the chart at left to expand. According to the proposed rule, to be classified as well capitalized, affected credit unions would be required to maintain a risk-based capital ratio of 10.5% or above, and pass both net worth ratio and risk-based capital ratio requirements. Adequately capitalized credit unions would be required to maintain risk-based capital ratios between 8% and 10.49% and pass ratio requirements. Undercapitalized credit unions would fall below 8% risk-based capital ratio. Additionally, individual federally insured credit unions could be required to maintain higher levels of risk-based capital to address unique supervisory concerns raised by the NCUA, according to the rule’s Board Action Memo. 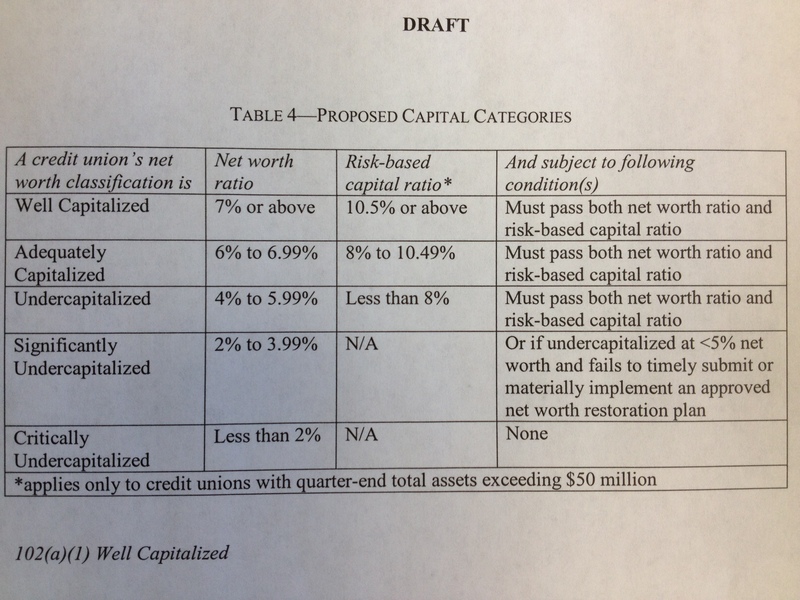 The risk-based capital proposal for natural person credit unions would replace the current risk-based net worth risk-weighting method, putting them more in line with the NCUA’s risk-based capital requirements for corporate credit unions, the NCUA said, as well as capital requirements at the FDIC, Federal Reserve and Comptroller of the Currency. The proposed risk-based ratio would be determined by the percentage of a credit union’s net worth available to cover losses, divided by the credit union’s defined risk-weighted asset base, the NCUA said. NCUA estimates that more than 90% of affected credit unions – approximately 2,237 institutions – would be in compliance with the proposed rule, based upon June 30, 2013 call report data. However, 189 credit unions would experience a decline in their PCA classification from well capitalized to adequately capitalized, and 10 well-capitalized credit unions would experience a decline to undercapitalized status. The NCUA estimated that, collectively, those 10 undercapitalized credit unions would need to retain an additional $63 million in risk-based capital to become adequately capitalized, assuming no other adjustments. The capital requirements and PCA supervisory actions for “new” credit unions and credit unions with fewer than $50 million in assets would remain largely unchanged. The rule was given a longer-than-usual comment period of 90 days. In July 2013, NCUA Chairman Debbie Matz said the current 7% net worth requirement would remain the base requirement in a proposed risk-based capital rule, as defined by the Federal Credit Union Act. Credit unions with more than $50 million in assets would be subjected to higher risk-based net worth requirements. Board Member Michael Fryzel was seeking a balanced approach to the rule in November 2013, advocating for a new standard that was not overly stringent or overly permissive. “I advocate ‘right sizing’ NCUA’s risk-based capital rules. One of the undeniable lessons learned from the crisis is the value of a financial institution’s capital—capital that is ample, durable and can be readily deployed to shore up a balance sheet under duress,” he said.